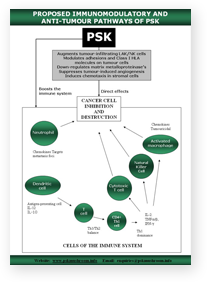 The benefits of PSK to lung cancer patients have been recently demonstrated in more advanced stage III disease where radiotherapy is only marginally effective. 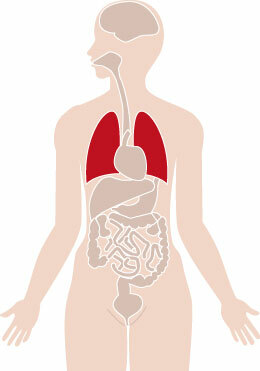 In a non-randomised controlled study of stage I/III non-small cell lung carcinoma, patients who responded well to radiotherapy were given PSK (3g/day) for two weeks followed by 2 weeks rest or placebo in 2-week repeated cycles22. 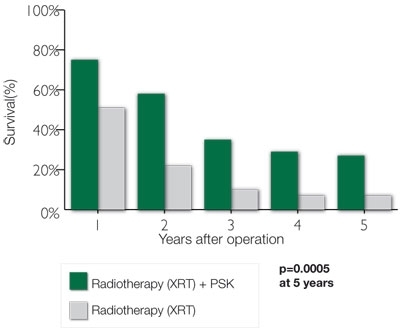 The patients (n=62) being given PSK experienced a significant overall improvement in 2-year (36/62(58%) versus 27/123(22%); p<0.0001) and 5-year (17/62(27%) versus 8/123(7%); p=0.0001) survival rates compared to the placebo group (n=123) (Fig. 3A). 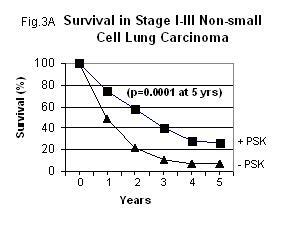 When stratified to disease stage and age, patients with stage I/II and stage III epidermoid carcinoma receiving PSK experienced significantly better survival rates (8/22(39%) versus 6/42(16%); p<0.005) and (7/32(32%) versus 2/46(5%); p<0.004) (Fig.3B), respectively than in the placebo groups receiving radiotherapy alone. 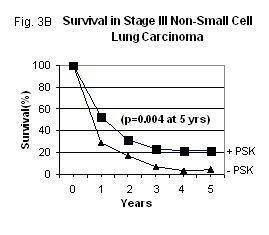 Furthermore, patients greater than 70 years old who received PSK had better 2- year and 5-year survival rates than those not receiving PSK (p <0.007).